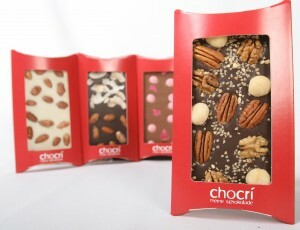 NEW YORK, Jan 16, 2010 / FW/ — Launching in time for Valentine’s Day, chocri’s customizable chocolate bars make the perfect, gourmet V-Day gift for that special someone in your life. Decorate your Valentine’s Day chocolate bar with a “My Valentine” plaque, or confections inspired by the romantic holiday, including heart-shaped smiley faces, marzipan roses, and candied rose petals. An offshoot of the widely popular German site www.chocri.de, the new site, www.createmychocolate.com , follows the same concept behind chocri: first, choose your chocolate base (dark, milk, or white), and then select “toppings” to customize your chocolate bar. Toppings include both the traditional (like nuts and dried fruit) and the outrageous (chives or jalapenos, anyone?)! Upon checkout, you can even create a personalized name for your chocolate bar, which will be inscribed on the package. The starting price for a bar is $7.90 (with toppings ranging from $0.10 for sea salt to $2.10 for real gold flakes! ), and there’s a 3-bar minimum per order (be it 3 of the same, or 3 different bars). Standard international shipping is $6 with deliveries from Germany expected within 2 weeks of ordering. To celebrate their U.S. expansion, chocri is offering a week-long FREE SHIPPING promo: consumers who place orders before the end of the day on January 18th will receive FREE standard shipping on their order! In addition, chocri chocolates are all organic and fair trade, with 1% of sales donated to DIV Kinder, a charity organization that cares for the needs of the children of the Ivory Coast (where a lot of cacao is produced).